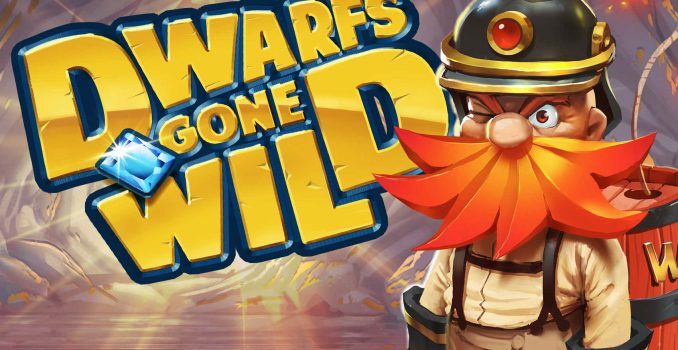 It’s been a while since Quickspin has released a new slot game, but now they have released a great new title, Dwarfs Gone Wild. Dwarfs Gone Wild is a 20 line slot game with a Snow White and the seven dwarfs theme. It also features wild symbols on all reels, bonus symbols on reels 2, 3 and 4 and a special mirror symbol on reel 3. On the left of the slot game you will see a Golden Minecart Bonus Meter. One cart will be active and each time you get a winning combination with any dwarf symbol the meter will fill up and award more carts. A maximum of 7 cart can be collected. If you trigger the free spins feature, with 3 bonus symbols, you will trigger 7 free spins with between 1 to 7 dwarf features, depending on the number of golden carts you have collected. Rolling Wilds – one wild symbol randomly placed on reel 3, 4 or 5 and moving one reel to the left after each re-spin. Spreading Wilds – Receive 1 random wild symbol which will explode and creates between 2 and 4 more wild symbols on adjacent positions. Throwback Wilds – Between 2 and 5 random wild symbols. Full Reel Wilds – Between 1 and 2 wild reels. Free Wild – One wild symbol placed on the best paying position. Extra Free Spins – 3, 4 or 5 extra free spins. Win Multiplier – One or more winning spins multiplied by 2, 3 or 5. Bonus symbols and mirror symbol do not appear during free spins. When the magic mirror lands on reel 3, you will receive 2 free re-spins with 300 extra Snow White symbols added to the reels. Dwarfs Gone Wild is an amazing online slot game. The game looks great, very colorful and has a very nice bonus and free spins feature. You can find Dwarfs Gone Wild at a lot of NetEnt casino, including Casumo and Vera & John. Be sure to also check out the gameplay video below.